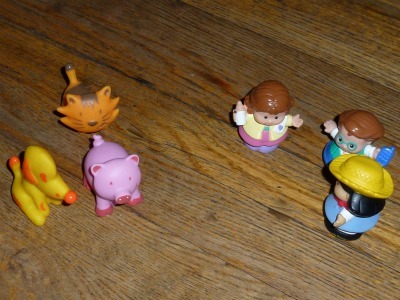 Sorting and Grouping: Teach your Toddler to Master his Environment! Preparation time: Sorting and grouping requires practically no prep time, as long as you have a small group of items on hand that your child can sort through. Game Duration: As long as you want, but generally between 5 and 15 minutes. What you will need: A variety of items to sort and, optionally, a few bowls or containers. Toddlers love to master their environment. They want the world to make sense and they want to be in charge of it. This is why toddlers are driven to explore piles of stuff! A big confusing pile of things can be sorted into sensible groups and by sorting and grouping your child gains knowledge and control over the pile of things. After painstaking categorization you will often see a toddler gleefully recreating the original disorder, in order to do it again! There is practically no limit to what type of item can be used in the sorting and grouping activity. For an educational boost, provide your toddler with well thought out piles of things which provide concrete experiences with specific concepts; such as color, shape, taste, texture, sound and function. Begin with something easy that your toddler is familiar with. Older toddlers may be ready to try more abstract categories. For colour, shape and size (visual) you can use colourful wooden beads or wooden blocks. For weight, texture and temperature (tactile), try sorting ice cubes and jello cubes. For taste and smell (olfactory) try sorting fruits and vegetables! 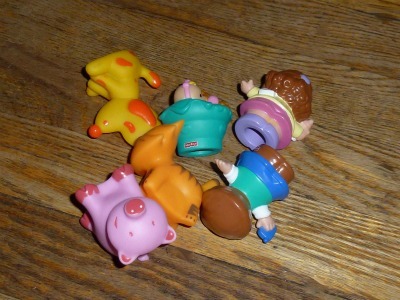 For kind (conceptual) try sorting different types of toys in their respective piles, such as the animals and the people in the pictures above! You can try sorting with your child, but before you jump in, be careful what criteria you are using. Your toddler may be exploring a different concept than you think, so let him make the decisions. Ask questions like "Where does this one go? ", and make statements about the characteristics of the object, such as "This is a heavy rock! ", or "I have a little one, do you want it?". Light involvement is key. Your toddler has a plan, and there's lots of learning going on! Try sorting different types of pasta noodles before you get involved in the stringing activity! It is not essential, but very helpful to have a few shallow bowls and baskets for your toddler to sort things into. He may get frustrated if his pile of sorted items grows into the other pile of sorted items. Do not be alarmed if your toddler brings his newfound sorting skills to the dinner table! If he is truly hungry, some of what is in his plate will eventually will make it into his mouth.